This article contains interesting facts, pictures and information about the life of the Powhatan Native American Indian Tribe of the Northeast woodland cultural group. The Powhatan tribe were leaders of the powerful league of tribes called the Powhatan Confederacy. They inhabited Virginia, from the Potomac River in the north to south of the James River, and parts of the Eastern Shoreline. Their leaders had absolute authority, unlike the more democratic tribes of the Northeast woodland cultural group. These powerful people lived in highly organized, fortified villages of Longhouses, called 'yehakins', which were surrounded by their farming lands containing their crops of corn, beans and squash that covered up to 200 acres. They were also hunters and fishermen in and around Chesapeake Bay using large canoes as much as 40 - 50 feet long. The English colonists in Virginia came into conflict with the tribe which led to a series of Powhatan Wars. The most famous members of the tribe were Wahunsonacock, who became known as Chief Powhatan, and his daughter, Pocahontas. The marriage of Pocahontas to John Rolfe brought peace to the Powhatans until the death of the old chief, her father, in 1618. 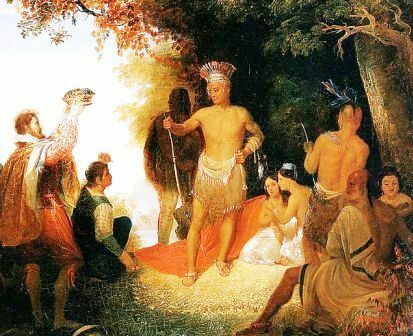 This article contains fast, fun facts and interesting information about the Powhatan Native American Indian tribe. Find answers to questions like where did the tribe live, what clothes did they wear and what food did they eat? Discover what happened to the tribe with facts about their wars and history. The Powhatan are people of the Northeast Woodland Native American cultural group. The location of their tribal homelands are shown on the map. 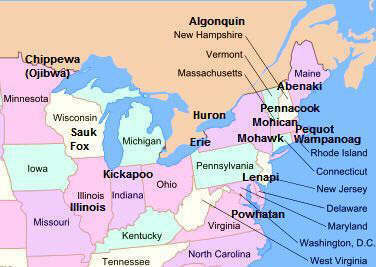 The geography of the region in which they lived dictated the lifestyle and culture of the Powhatan tribe. The Powhatan tribe lived in towns of Longhouses made with birch bark. 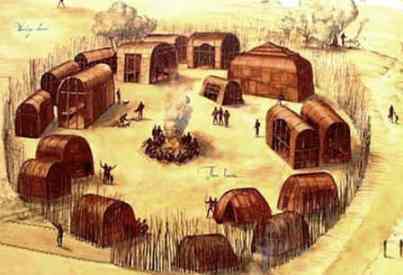 The longhouses varied in size, the largest longhouses were 200 feet long, 20 feet wide and 20 feet high, had two levels and housed as many as twenty families. The windowless Longhouses had a rounded roof, doors at both ends and a smoke hole in the roof that let in air and light. Their villages were generally located alongside a river and consisted of from three to one hundred different structures. The elongated longhouses were made of saplings that were bent and tied and covered with bark and woven mats. Most Algonquian speaking Native Indians made birch bark or dugout canoes for transportation. Powhatan Native Americans built heavy dugout canoes made from the from hollowed-out logs of large trees. The men of the Powhatan tribe wore simple clothes made from deerskin (buckskin) which consisted of a breechcloth that was passed between the legs and attached to a cordage belt. Leggings and moccasins were worn on hunting trips in the forests. The women wore a deerskin apron and like the men they also wore moccasins and leggings when working on the land or gathering food in the forest. Fur cloaks were worn in the winter. Their clothes were often decorated with painted designs, fringes and beads. The important men and chiefs of the Powhatan tribe frequently made cloaks from the feathers of birds. Cloaks were tied above the left shoulder and were long enough to reach below the knees. Both men and women of the tribe tattooed their bodies and painted their faces with a mixture of red paint and nut oil. The Powhatan Tribe was one of the most famous tribes of Native American Indians. Discover the vast selection of pictures on the subject of the tribes of Famous Native Americans such as the Powhatan nation. The pictures show the clothing, war paint, weapons and decorations of various Native Indian tribes, such as the Powhatan tribe, that can be used as a really useful educational resource for kids and children of all ages. We hope you enjoy watching the video - just click and play - a great social studies homework resource for kids .